*Updated* Uploaded the right revision, sorry for the inconvenience. I was brainstorming on what to post weekly and decided to post a “Japanese Snacks and Desserts” Series. Every week I’ll post about 5 random desserts that are common in Japan. One of my favorites. It’s so common in Japan that in every corner there’s a crepe shop. Unlike the French variant, Japanese crepes are usually handheld. The pancake part of the crepe is also slightly softer than it’s French counterpart. The greatest part of the Japanese Crepe is in it’s variety on fillings. Although the same flavors as the usual Crepe, they put way more fillings on the Japanese one and less butter (i.e. Chocolate, Strawberry, Ice cream, etc.). The top crepe stores in Japan are Marion Crepes, Cafe Crepe Harajuku, and Santa Monica Crepes. All crepe stores in Japan are mostly pink and have plastic replicas of what they sell displayed in front of their shop, so it’s hard to miss them. There are many kinds of Mochi, for now I’ll tell you about the Ice Cream variant. A Mochi Ice Cream is usually made using Mochiko Flour. There’s a difference in Mochiko and Traditionally made Mochi. The Ice Cream one is made by Mochiko flour which is applied directly onto a mochigome rice. The traditional Mochi is made by being pounded with mochigome rice. Take note that there are many Japanese Rice Flours (Mochiko, Shiratamako, Domyojiko, Mijinko, and Kanbaiko) That’s a lot to explain so just search for it. Here’s the top places on where to get Ice Cream Mochi “10 Best Places to Buy Mochi Desserts in Tokyo“. Castella, originally an exclusive dessert of Japanese Aristocrats. It’s a spongecake made from sugar, eggs, flour, and starch. It doesn’t have any toppings aside from the thin layer of hard sugar on top. It’s simple and it’s yummy. It’s a thick jelly dessert made with red bean paste and agar. It’s eaten in small slices. There are two types neri yōkan and mizu yōkan the latter is eaten in summer. “Mizu” means water. I haven’t eaten a Yokan yet so I don’t know what it tastes like. Yokan is usually found in souvenir shops all around Japan. 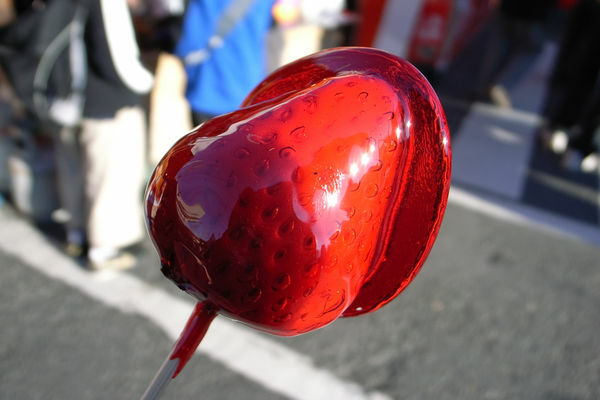 Pretty common at Japanese Festivals, these candies are usually available in strawberry or apple flavor, they are also sold via festival games. The kind of games where you can get Ame Candies are: you spin a wheel and depending on what it lands on is your Ame’s flavor, or you launch a ball in a pinball like machine and where it lands on will determine the flavor and how many Ame Candies you can get! Personally I don’t like this one, it sticks on your teeth and hard to manage once it melts on your fingers. It’s tasty once you get to the fruit part. Every festival has one (I think). Previous Previous post: 8 Must Watch Anime for Spring 2017!